St. Patrick’s Day isn’t all too far away. 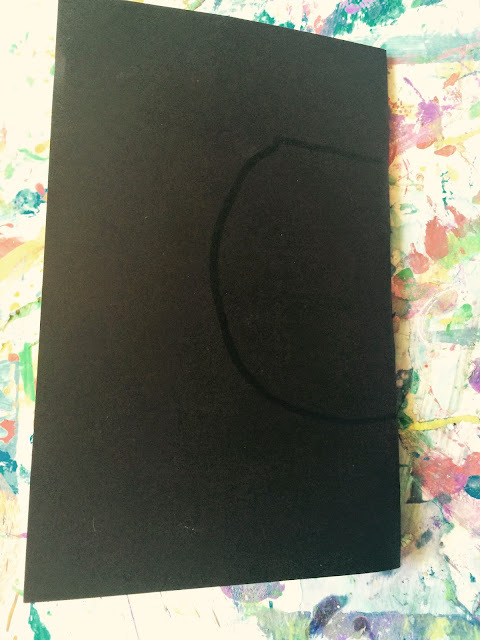 I was thinking about what kids’ art activities would be perfect for this holiday, and I realized that I already have one. And, it’s GLITTER!!! I know a lot of you are afraid of glitter, but I’m a fan. It’s perfectly ok to get a bit anxious when your child wants to get the sparkly stuff out. Aside from the fact that she’ll probably pour it all over the place, it seems to stick around forever (evidenced by the glitter flecks that have been stuck in my living room carpet for the past few days – following an incident where the cat batted the glitter tube off the table). Many months ago we did a rainbow glitter clay paint. What’s clay paint? It’s just like finger painting, but with super-slippery modeling clay. 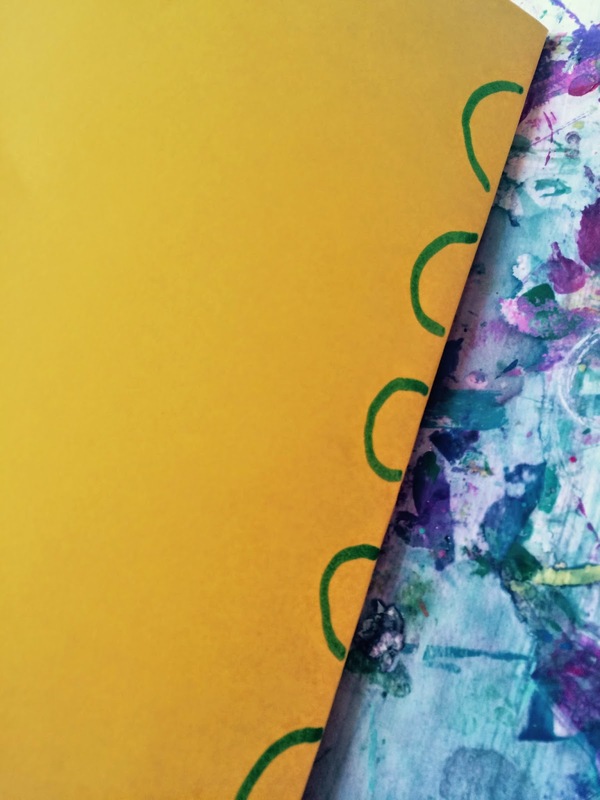 It gives those fine motor skills a work out and is somewhat neater than using real paints. It also traps the glitter, meaning that the sparkles won’t get quite as messy. 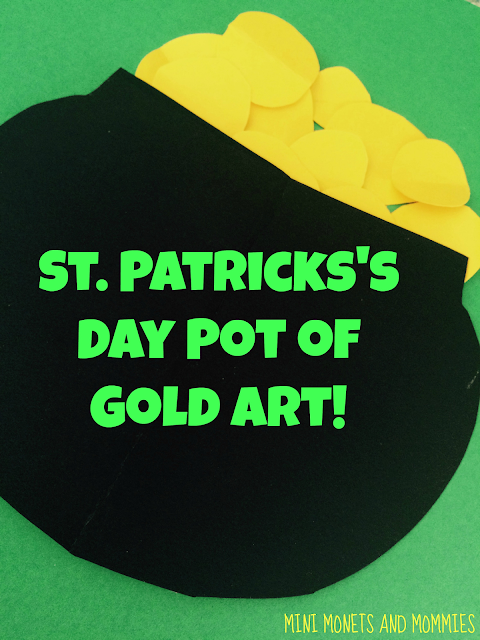 To turn the clay paint into a St. Patrick’s Day project, I added a pot of gold paper collage! 1. Pull the first color of clay apart into quarter-sized pieces. Have your child roll a piece into a snake shape. 2. 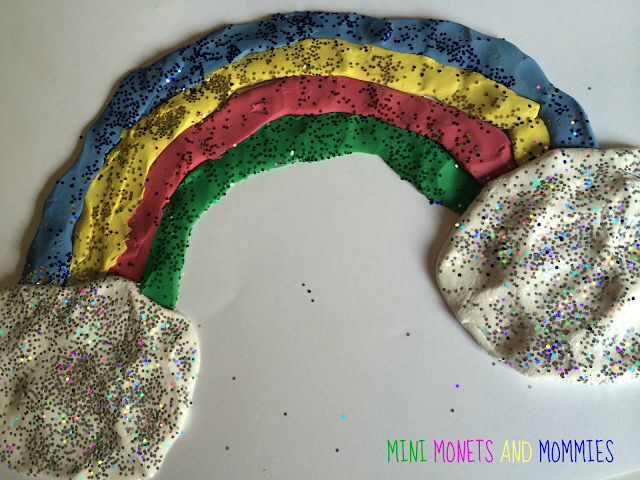 Pour a tiny pool of glitter (in the same color as the clay) onto a piece of scrap paper. Roll the clay through it, smooshing the glitter in. 3. Spread the glitter-covered clay onto the white card stock, making a semi-circle rainbow shape. Your child can stretch out the clay with her fingers, ‘painting’ it on. It will stick to the paper the more she presses it in. 4. Repeat the steps with the other colors, making more bands on the rainbow. 5. Roll the Model Magic into two golf ball-sized balls. Your child can smash the Model Magic into opal-colored glitter. 6. 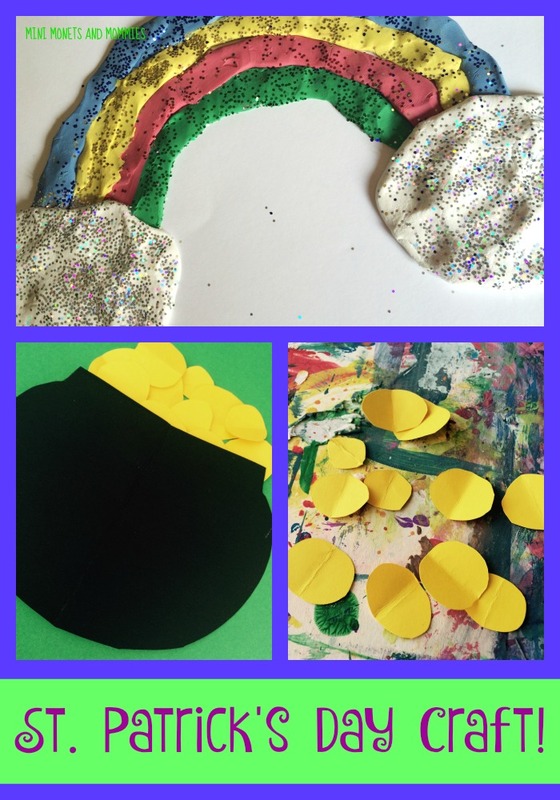 Press the Model Magic onto each end of the rainbow to make clouds. 7. Fold the black paper in half, book-style. 8. 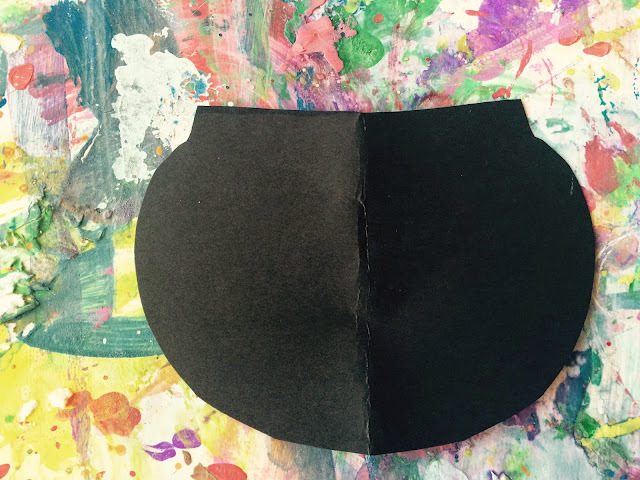 Draw half a circle on the paper, with a flat top starting at the fold. 9. Cut the half circle out. 10. Open the paper to reveal the pot for the St. Patrick’s Day pot of gold. 11. 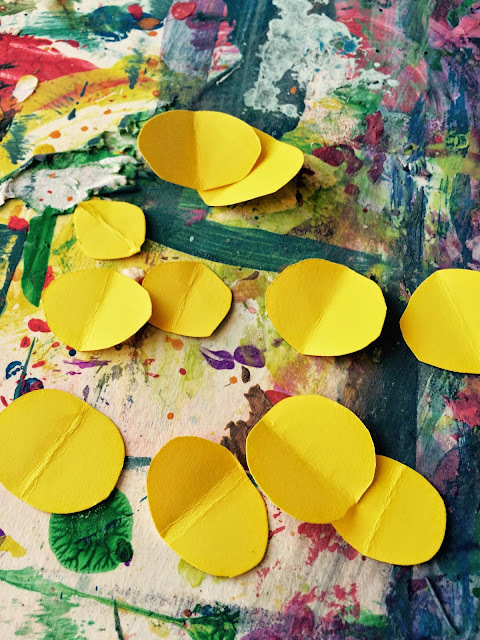 Fold the yellow paper in half. 12. 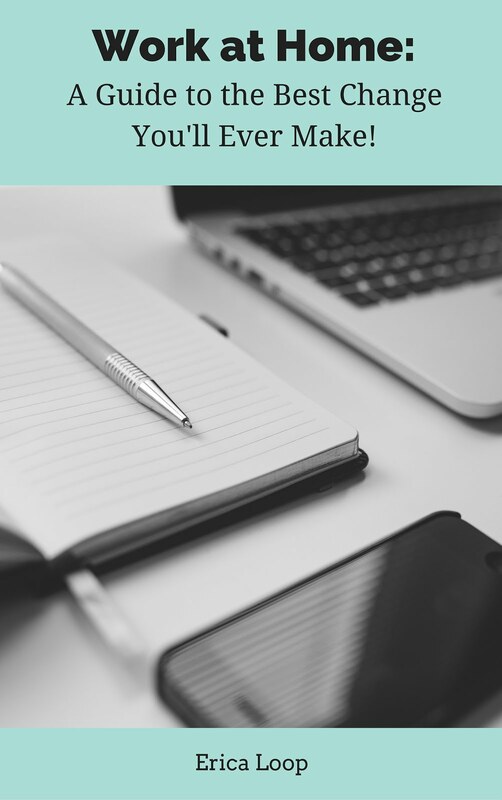 Draw half circles on the paper at the fold. 13. Cut the circles out and open them to make gold coins. 14. Glue the pot and the gold onto the paper near the rainbow.